Cost: $4250 USD or Euro equivalent, all inclusive including domestic flight. This epic 10 day / 09 night photography workshop features Northern Iceland visiting the snowy Myvatn and Akureyri regions and superior chances of viewing the aurora borealis, and then continues through the remote Eastfjords, and spends the final half of the trip in the classic southeast coasts and Vatnajökull glacier region including ice caves and Jokulsarlon icebergs. Wild Watch Tours Ltd of United Kingdom and Wildernesscapes Photography LLC are co-leading trip, from the classic south coast waterfalls and glaciers to the snowy North. This tour features two photography guides with decades of combined experience leading trips, for outstanding coaching and learning opportunities in your photography! Co-guiding is Peter Jones, founder of WildWatch Tours Ltd from the United Kingdom. The trip begins with your included late morning time domestic flight from Reykjavik (city airport - not Keflavik) up to Akureyri, Iceland's 2nd largest town with just 10,000 people. You will be greeted upon arrival to the airport and picked up, and then head straight out on tour! We'll first swing through Akureyri Iceland's 2nd largest town for an overview and visit an Icelandic country church on the arctic ocean shoreline of Eyjafjordur, Iceland's largest fjord. Later in the afternoon we'll photograph the cirque-shaped waterfall of Godafoss, for several different perspectives. Our sunset shooting location will be around the famous geothermal areas of Myvatn lake and craters, Dimmuborgir and other lava formation. At night, weather permitting we'll do possible nighttime or aurora photography over the Myvatn formations. Accommodations in Myvatn. Today is our 2nd full day in the Jokulsarlon glacial area, featuring a visit to the otherworldly glacial ice caves with a highly seasoned local guide, experiencing and photographing this phenomenon unique to Iceland -- exploring the stunning translucent blue interior of the ice caves. This ice cave trip is included in the trip price. We'll then spend the rest of the day and possibly night in the glacial lagoon regions photographing ice chunks washed up on the black sand beach, and icebergs in Jokulsarlon. Accommodations near Jokulsarlon. On our last day, we'll enjoy our last morning photographing around the Vik area black sand beaches such as Reynisfjara, before all the day-tourists arrive in busses, and then continue now westward to Skogafoss and Seljalandsfoss waterfalls, which are among Iceland's most famous and visited waterfalls, our last stops of the trip. Midday we'll return to Reykjavik, in time for afternoon flights of 2pm or later today. Included airport dropoff. End of Trip. No accommodations are included tonight in Reykjavik, but you may choose to stay on longer on your own in the city. Group Size: Maximum size of 12 photographers; minimum size of 4. Start/End: The trip starts morning on March 11, 2018, with a late-morning domestic flight from Reykjavik to Akureyri, and the trip concludes on March 20th at 12:00 noon upon return via vehicle to Reykjavik or direct to Keflavik airport, your choice. The trip cost includes domestic airfare to Akureyri from Reykjavik at the beginning of the trip (to be booked on your behalf once your international flights are booked on our own). We'll be so immersed in the Icelandic countryside for our entire time as a group, that we have left no time to enjoy the sights of Reykjavik, so we encourage you to stay in Reykjavik for a couple days on your own, either before or after the tour. Accommodation for 09 nights (in Icelandic guesthouses and country hotels; accommodation is based on double occupancy, single room upgrade may be requested for an additional single supplement fee of $75/night; roommate matching service included. In the event no suitable like-gender rooming partner works out and you get upgraded to a single room automatically, then you will be asked to pay a 50% subsidized single supplement fee of $38/nt.) (Most rooms include private bath but a couple may not). Photographic topics that will covered while shooting include nighttime and austral photography, Aurora Borealis photography, classic landscape photography composition and technique, HDR (High Dynamic Range) imagery, panoramic photography, adventure and travel photography, and slow shutter speed effects. Our full 09 days and nights of photography potential allow us to see a variety of well-known Icelandic natural wonders around Akureyri, Lake Myvatn, and the Snæfellsness Peninsula, and combined with austral wonderment, enable each participant to get the most out this once-in-a-lifetime trip. In good daytime weather and clear night skies, March days can be long; occasionally our groups are putting in 15+ hour days, but the average is 10-12 hrs! A maximum group size of 8 photographers ensures you will receive ample personal photographic coaching in the field from a full time working pro, and provide an intimate small group adventure experience. This trip features two guides, Johnathan Esper of Wildernesscapes Photography LLC (USA) and Peter Jones of Wildwatch Tours Ltd (UK). Johnathan Esper is the principal location guide on this trip, his 60th+ in Iceland. 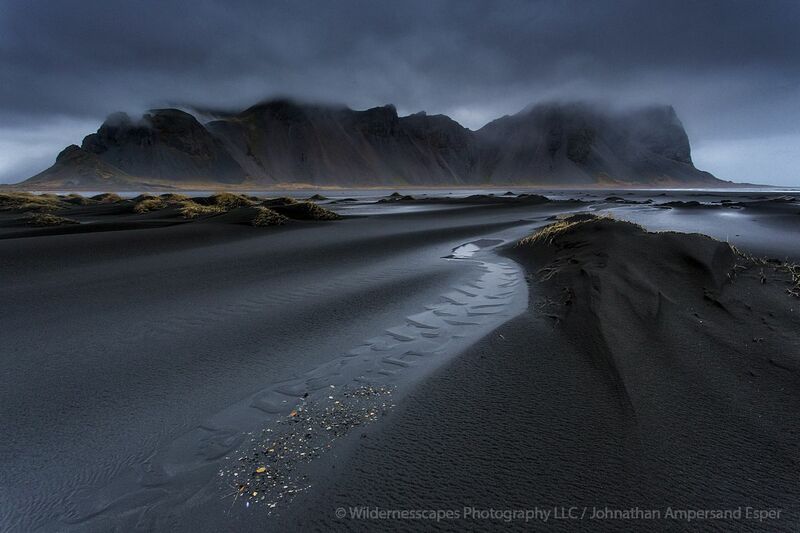 Johnathan is a full time photographer and international photo trip leader, and has a unique background and an intimate knowledge of Iceland from living out of a car, exploring and photographing Iceland intensively for months at a time. He specializes in wide panoramic landscapes and adventure photography in Iceland and the Adirondack region in the USA. Peter Jones is the founder and MD of Wildwatch Tours Ltd., a photo tour company based out of the United Kingdom. Peter has a lifetime interest in Natural History. Peter is the past Chairman of The Royal Photographic Society Nature Group and past President of the Leicester & Leicestershire PS, and now a member of Eastwood PS and Claycross PS, and now lives in Nottinghamshire. Peter has visited many countries as a naturalist and wildlife photographer. He is an excellent organiser and communicator with a delightful sense of humour, which makes him a popular tour leader. Final Payment: The final payment for the balance due on the trip (after your paid deposit), is due three weeks prior to the trip start. Payment options include bank transfer to my Icelandic bank account (details on request), cash in person at the trip start (with prior permission), personal or bank checks (preferred for USA and Canada clients), and credit cards (a 2.5% credit card fee will be added for final payments with card).